Business-IT alignment is hot, and that’s not new. As regular readers know, my suggestion to attack the business-IT alignment problem is a model-driven approach. In a previous article I presented a framework for Model-Driven SOA in which we have seen that the starting point for a Model-Driven SOA approach is an organization model. While the organization model is the starting point of a model-driven process in which each model is as much as possible is automatically derived, it is important that this model is coherent, consistent, and concise. In this article I want to explain the theory of Enterprise Ontology which describes a well-founded method to model the essence of an organization in a coherent, comprehensive, consistent, and concise way. The theory presented in this article is relatively new and differs quite a bit from existing organization modeling methods. I think Enterprise Ontology can offer advantages in understanding the essence of an organization and in using organization models as a starting point for building software supporting organizations. Enterprise ontology is focused on the essence of the operation of an organization, meaning that it is fully independent of the (current) realization and implementation of the organization. The theory that underlies the notion of enterprise ontology as presented by Dietz  is called the PSI-theory . Dietz uses this theory to construct a methodology providing an ontological model of an organization, i.e. a model that is coherent, comprehensive, consistent, and concise, and that only shows the essence of the operation of an organization model. This methodology is called Design and Engineering Methodology for Organizations (DEMO). Compared to its implementation model, the ontological model of an enterprise offers a reduction of complexity of over 90% . This reduction of complexity makes an organization for a manager intellectual manageable and transparent. It also shows the coherence between all fields within the enterprise, like business processes, workflow, organization structure, etc. DEMO has been widely accepted in both scientific research and practical appliance. It has been used as a base for formalizing enterprise architecture and governance [2, 3, 4] and for formalizing the splitting and allying of enterprises . Further research has extended DEMO by constructing an ontological model of an information system supporting the enterprise model (the BCI-3D method) . More recently enterprise ontology has been used to construct a formal framework for service specification . An extensive ten year study executed with 28 projects concluded that DEMO is a good method for the fast (re)design of organizations . The overall goal of the PSI-theory (the theory behind the notion of Enterprise Ontology) is to extract the essence of an organization from its actual appearance. It presents four axioms that help to achieve this goal . The operation axiom tells us that the implementation independent essence of an organization is that it consists of subjects fulfilling actor roles. A subject fulfilling a certain actor role is called an actor. Actors constitute the operation of an organization by performing two kinds of acts: production acts and coordination acts. By performing production acts (P-acts for short) the subjects contribute to bringing about the goods and/or services that are delivered to the environment of the organization. The results of P-acts are production facts (P-facts for short), which can be divided into material (something is manufactured, stored or transported) and immaterial (decisions or judgments) facts. By performing coordination acts (C-acts for short) subjects enter into and comply with commitments towards each other regarding the performance of production acts. A C-act is performed by one actor, the performer, and directed to another actor, the addressee. C-acts consist of an intention (e.g. request, promise, question, assertion) and a proposition (the performer proclaims the fact and the associated time the intention is about) and result in coordination facts (C-facts for short). A graphical representation of the operation axiom is presented in Figure 1. As visualized, P-acts have effect in the so-called production world (P-world for short), C-acts have effect in the coordination world (C-world for short). The state of a world at a particular point in time is the set of facts created up to that point of time. The creation of a fact of some type is a state transition in one of the two worlds. The transaction axiom tells us that C-acts are performed as steps in universal patterns, called transactions. This axiom reveals universal socionomic patterns of coordination that hold for all organizations. The standard pattern of a transaction is shown in Figure 2. A white box represents a C-act type and a white disk represents a C-fact type. A gray box represents a P-act type and a gray diamond a P-fact type. Two actors are involved in a transaction, the initiator and the executor. A transaction evolves in three phases: the order phase (O-phase for short), the execution phase (E-phase for short), and the result phase (R-phase for short). In the O-phase the initiator and executor work to reach an agreement about the intended result of the transaction, i.e., the P-fact the executor is going to create as well as the intended time of creation. As shown in Figure 2 the initiator starts the transaction by requesting something from the executor. The C-fact ‘rq’ is created and the executor can either decline the request (after which the initiator can request again or quit the transaction) or accept the request by promising to deliver the requested P-fact (the C-fact ‘pm’ is created). In the E-phase, the P-fact agreed upon in the O-phase is actually brought about by the executor. The gray box and diamond in Figure 2 reflect this phase. A transaction ends with the R-phase in which the initiator and the executor work to reach an agreement about the P-fact that is actually produced, as well as the actual time of creation (which may both differ from what was agreed upon in the O-phase). Only if this agreement is reached the P-fact will come into existence. In figure 2 this phase starts when the executor states that the delivery of the P-fact has been done (C-fact ‘st’ is created). The initiator can either reject (after which the executor can state again or stop the transaction) or accept (thereby ending the transaction). The result of a successful transaction is the creation of a P-fact. A business process is a collection of causally related transaction types, such that the starting step is either a request performed by an actor role in the environment (external activation) or a request by an internal actor role to itself (self-activation). The distinction axiom tells us that actors exert three basic human abilities: performa, informa, and forma. Through the distinction axiom a substantial reduction of complexity and diversity is achieved, regarding both the coordination and the production in an organization. The forma ability concerns the form aspects of communication and information. As shown in Figure 3 communicative acts at the forma level are about uttering (speaking, writing) and perceiving (listening, reading). Production acts at the forma level are datalogical in nature, meaning that they store, transmit, copy, destroy, etc. information. The informa ability concerns the content aspects of communication and information. Communicative acts at the informa level express thoughts (formulating) or educe thought (interpreting). 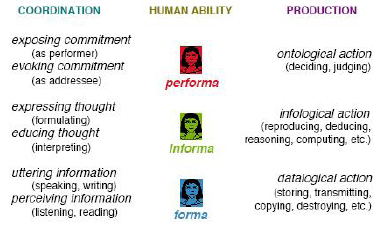 Production acts at the forma level are infological in nature, meaning that they reproduce, deduce, reason, compute, etc. information. Note that on this level we deal with communication and information while fully abstracting from the form aspects. Figure 3 summarizes the different acts on this level. The performa ability concerns the bringing about of new, original things, directly or indirectly by communication. 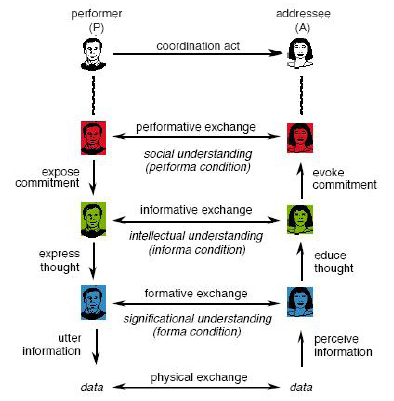 As can be seen in Figure 3 communicative acts at the performa level are about exposing or evoking commitment. Production acts at this level are ontological in nature, meaning that they decide or judge about something. The performa ability is considered as the essential human ability for doing business of any kind. This additional layer is important as it explains and clarifies the organizational notions of collaboration and cooperation, as well as notions like authority and responsibility. 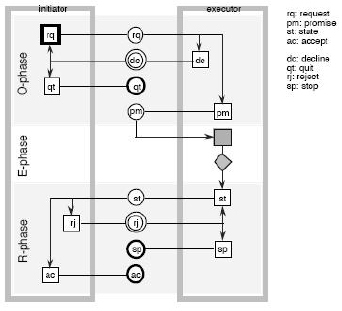 In order to successfully perform a C-act (as presented before in the operation axiom) the communicative acts at all three levels have to be performed, as visualized in Figure 4. The performer (P) has to expose his commitment to the addressee (A) to perform the C-act, i.e., P and A have to come to a social understanding. The only way to gain that understanding is by reaching an intellectual (or semantic) understanding. P has to express his thoughts, while A has to educe this thoughts and to confirm that she has (intellectually) understood P’s information. P can only express a thought by formulating it in a sentence in some language, and by uttering it in some form, such as speaking or writing. A, on the other hand, can only educe the thought by listening or reading it. So, another level of understanding is needed, called significational (or syntactic) understanding. Lastly, we of course need some physical exchange of data, i.e., the field of (tele)communication technology. Dietz assumes the condition of correct physical transmission to be included in the forma condition . We can make the similar distinction between the three levels of abstraction on the production side. Examples of acts on each level are mentioned before and summarized in Figure 3. Transactions having an ontological P-act as result are called ontological transactions. Infological transactions, i.e., transactions having an infological P-act as result, are considered to be a matter of realization of the ontological transactions. Infological transactions only reproduce or derive knowledge that is needed by the ontological actors. Datalogical transaction, i.e., transactions having an datalogical P-act as result, are in their turn, considered to be a matter of realization of the infological transactions. They only care for the storage and retrieval, the copying, and the transmission of documents containing information that is needed by the infological actors. In the previous section I have presented the four axioms of enterprise ontology. As stated before they all serve the overall goal of the PSI-theory to extract the essence of an organization from its actual appearance. The operation axiom abstracts the implementation independent essence of an organization to actors, acts and facts. The transaction axiom brings another reduce in complexity by combining acts in universal patterns holding for each organization. The composition axiom brings us the notion of business process and lastly the distinction axiom reduces complexity even more by providing a distinction between acts on different layers of human ability. The organization theorem combines the benefits of these axioms into one concise, comprehensive, coherent, and consistent notion of enterprise . This theorem states that the organization of an enterprise is a heterogeneous system that is constituted as the layered integration of three homogeneous systems: the B-organization (from Business), the I-organization (from Intellect), and the D-organization (from Document). We call these three systems the aspect systems of the (total) organization. Figure 5 visualizes the organization theorem and shows us that the D-organization supports the I-organization, which supports the B-organization. 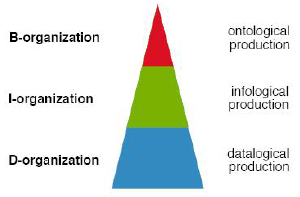 The coordination parts of these three systems are similar, they only differ in the kind of production: the production of the B-organization is ontological, the production in the I-organization is infological, and the production in the D-organization is datalogical. Dietz draws a clear distinction between the realization and the implementation of an organization. By the realization of an organization he means the thorough integration of the three aspect organizations. The implementation of an organization is the making operational of the organization’s realization by means of technology . The integration of the three aspect organizations is established through the layered nesting of them. As said before a system in some layer supports the system in the next higher layer, e.g., the D-organization supports the I-organization, which supports the B-organization. Controversily, a system in some layer uses the system in the next lower layer. When a layer supports another layer its function supports the construction of the other layer, e.g., the function of the I-organization supports the construction of the B-organization. The distinction of the function perspective (F) and the construction perspective (C) provides a more elaborated view on the layered integration of organizations and is visualized in Figure 6. As said before, Dietz defines the implementation of an organization as the making operational of the organization’s realization by means of technology. He refers to the possible ways of implementation of actor roles, C-acts, and P-acts as actor role technology, coordination technology, and production technology . We have seen that enterprise ontology as described by Dietz gives a well-founded theory about enterprises. The DEMO methodology is based on this theory and describes a set of models to model an organization and how to create these models. We leave the explanation of DEMO for a future article. If you are curious you can read one of the references (listed below) or you can take a look at the homepage of the DEMO knowledge centre. What I like about enterprise ontology is that it is focused on collaboration and social interaction among actors. The focus on transactions between social actors gives a better insight in the construction of an organization. It also can lead to a more dynamic and flexible view on organizations because you can look at it as a collection of autonomous actors dealing with incoming events and performing actions based on these events and a set of rules. I especially like the distinction axiom which delivers a clear, well-founded layering of organizations. This axiom reduces the complexity of organization models by abstracting away from implementation details. However, in contrast with other approaches it is well-defined what elements should be modeled on what abstraction layer. I think the distinction axiom can play an important role in defining model-driven approaches using an organization model as starting point. In other words: enterprise ontology can deliver us a theoretical foundation for defining the needed models of a Model-Driven SOA methodology. J. L. G. Dietz. Enterprise Ontology. Springer-Verlag, Berlin Heidelberg, 2006. J. A. P. Hoogervorst. 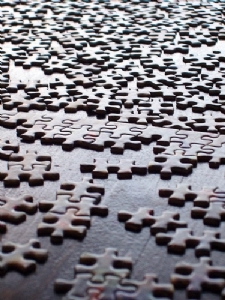 Enterprise Architecture: Enabling Integration, Agility and Change. International Journal of Cooperative Information Systems, 13(3):213-233, 2004. J. A. P. Hoogervorst. Enterprise Governance & Architectuur – Corporate, IT en enterprise governance in samenhangend perspectief. Sdu Uitgevers bv, Den Haag, 2007. J. Dietz and J. Hoogervorst. Enterprise Ontology and Enterprise Architecture – how to let them evolve into effective complementary notions. GEAO Journal of Enterprise Architecture, 1, 2007. M. Op ‘t Land. Applying Architecture and Ontology to the Splitting and Allying of Enterprises. PhD thesis, Delft University of Technology, Schildmos 13, 3994 LS Houten, Netherlands, June 2008. A. Albani and J. Dietz. The benefit of enterprise ontology in identifying business components. In WCC ’06: Proceedings of the IFIP World Computer Congress, Santiago de Chile, Chile, 2006. G. Hardjosumarto. An Enterprise Ontology based Approach to Service Specification. Master’s thesis, Delft University of Technology, Delft, the Netherlands, October 2008. J. Mulder. Rapid Enterprise Design. PhD thesis, Delf University of Technology, 2006. J. Dietz. Enterprise ontology – understanding the essence of organizational operation. Enterprise Information Systems VII, pages 19-30, 2006.